Fodies are small weaver birds - so named for their nest-building technique that involves weaving elaborate dome-shaped nests out of grasses and other plant material. 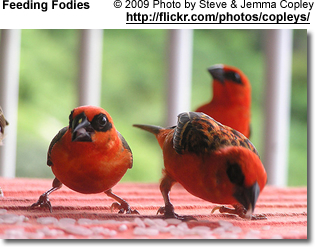 These finch-like birds are native to the islands of the western Indian Ocean where they occur on Madagascar, the Seychelles, the Comoro Islands and the Mascarene Islands. They typically inhabit forests, woodland or scrubland. However, they have also adapted well to living in urban areas. They measure 4.8 - 5.9 inches (12 - 15 cm) in length and have short, cone-shaped bills. Breeding malesl have bright red or yellow markings on the head and sometimes elsewhere. 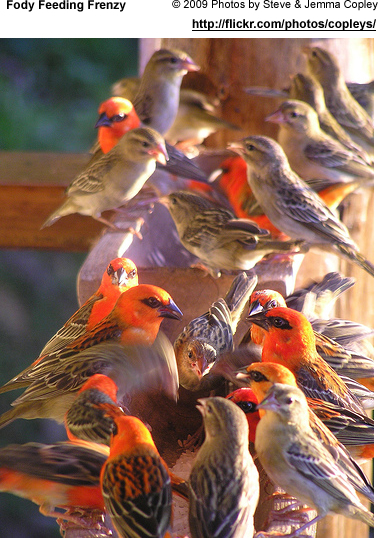 Non-breeding males and females are dull, sparrow-like birds with mostly grey-brown plumage. The diet varies by species. 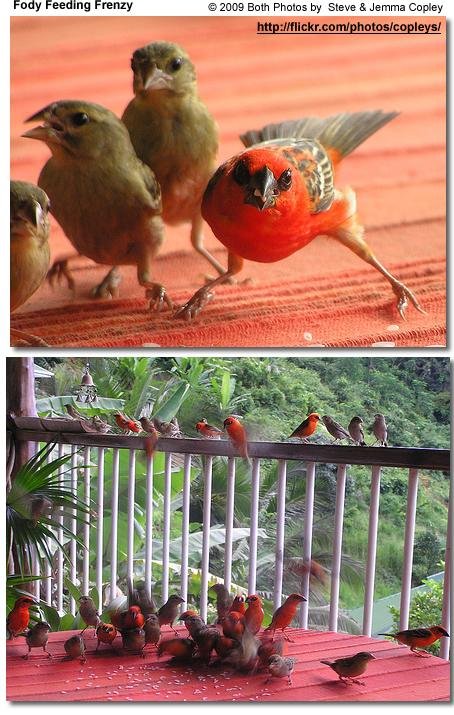 This group of birds feeds on grass and rice seeds, insects, arthropods (such as caterpillars, moths, spiders and beetles), nectar, fruits, geckos and possibly the eggs of other birds.